This is old version Star Wars™: Galaxy of Heroes 0.5.149973 apk for Android, you can install it if you want to downgrade or install old app. It is top Role Playing apps from ELECTRONIC ARTS. Each character has special ability to contribute in the team. Therefore, the player should be smart when selecting the characters. Moreover, it is okay to collect the iconic heroes. The characters of Star Wars are not only from the original trilogy and prequel movies, but you can also get the new characters of Star Wars from Star Wars Rebels or even Star Wars: The Clone Wars. The team will be stronger if you can add a new hero. Each of them has unique ability and powerful attack. Having the strong squad is not enough to master Star Wars game. You need to build a smart strategy to defeat the enemy in the game. You will become the leader which controls all members in the squad. Enhance the power and ability of the squad by unlocking their abilities. 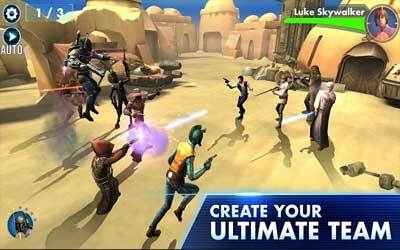 Now, enjoy the multiple fun and excitement when you play Star Wars™: Galaxy of Heroes for Android.